The Spoils is a customisable / collectible / trading card game (I'm getting confused about what term I'm supposed to be using these days) the aim of the game being to reduce your opponent faction’s influence to zero. This is achieved by playing minions out of your deck as well as employing instant effect and support cards and carefully managing the resources required to bring these cards into play. The Basic Box of Awesomeness is your entry into the game. It presents you with five starter decks, each covering the five trades, which is The Spoils name for their themes, they can’t call them factions as Spoils uses the word faction to represent you deck (confused yet?). 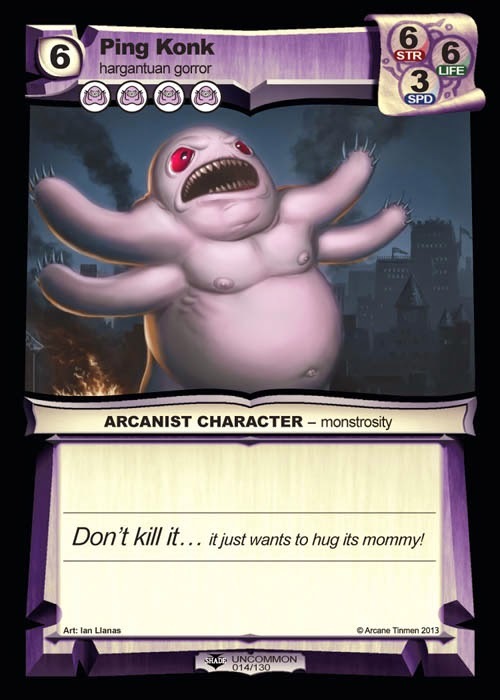 The intriguing element of The Spoils is that every minion in the game not only has your typical strength and life stats but also a speed which dictates when your cards get to inflict damage. This makes combat not just a careful balance of who to attack but also when. There’s also an interesting approach to resources. To put a card into play you have to spend the required resource cost by ‘attaching’ resource cards you have in play, but you also have to have the correct number of a named resources in play. For example the Dandy Day Trader has a costs 4 resources but also requires for you to have 1 Greed in play, you don’t have to spend that Greed as a resource you merely have to have it on the table. More powerful cards, such as Pink Kong require not only a large number of resources but also a high number of their trade’s resource e.g. Pink Kong costs 6 resources but also needs 4 Obsession in play. The real beauty here is that any card can become a nameless resource so if you’re short you can always sacrifice a card from your hand to turn it into a resource. In a single trade deck, this effect merely slows down the approach of the more powerful cards. In a deck constructed from multiple trades you’re going to have to skip some of cards that are reliant on large numbers of a specific resource. 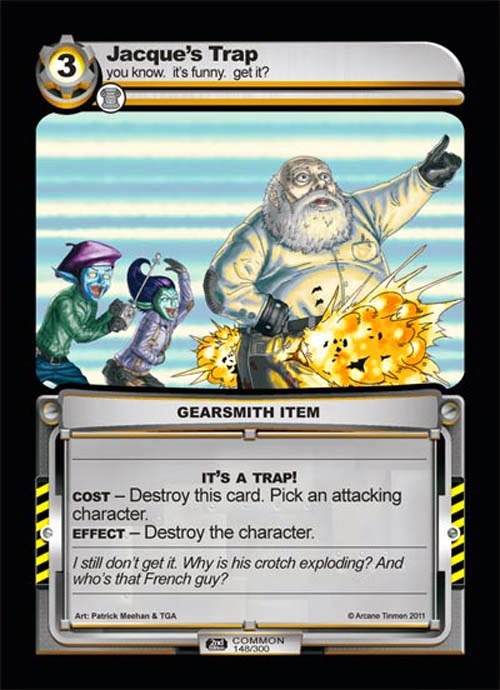 Speaking of trades, these are the most deliciously bonkers card types I’ve ever seen. The Warlords and Rogues are both the most straight forward trades, based around hitting hard and backstabbing respectively. The Arcanists are bowler hat wearing wizards who manipulate and change the game. 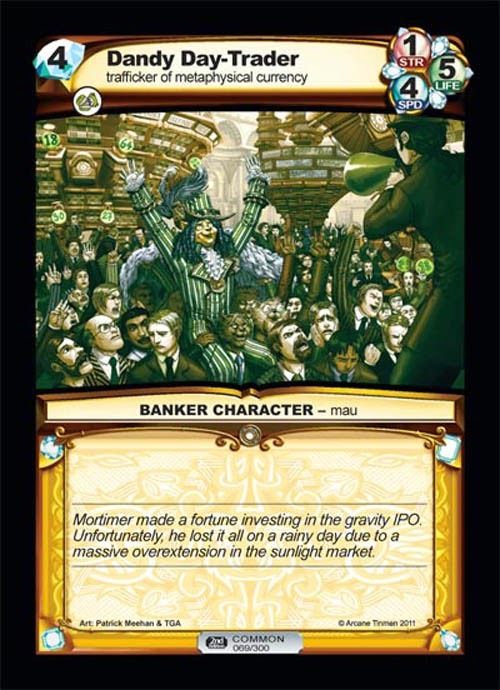 The Bankers are, quite literally, fat cats resplendent with cash, expensive lawyers and hired goons while the Gearsmiths are L33t speaking elves who swamp their opponents with an army of tiny micromajigs. These nicely sum up the lunacy of The Spoils, a game that pays homage to familiar tropes of fantasies but while taking a very sideways view the world. Instead of your typical elves, dwarves and dragons spoils delights in sexual and toilet humour. Everything about The Spoils is a bit nuts whether it be a Drive by Boobing or the most dangerous creature in your deck being a giant dodo with a gas problem. This is truly where The Spoils sets itself apart from almost every single game I have ever played. You can’t help smiling when reading the cards and some actually made me laugh out loud in the middle of a game. 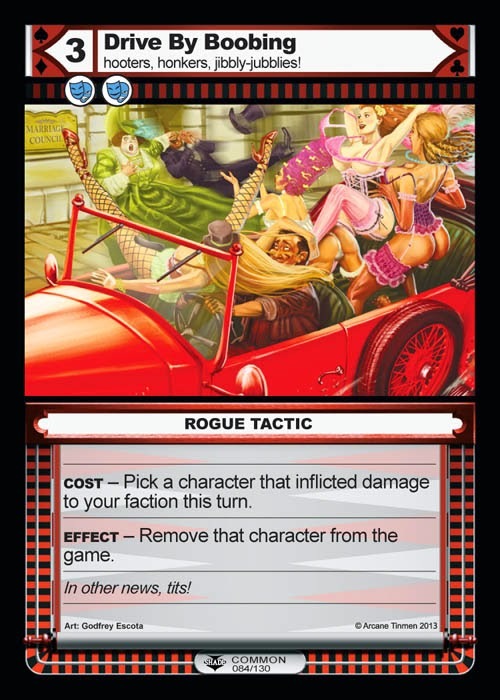 What’s more every single card works mechanically in line with its twisted theme. The Basic Box of Awesomeness truly lives up to its name. 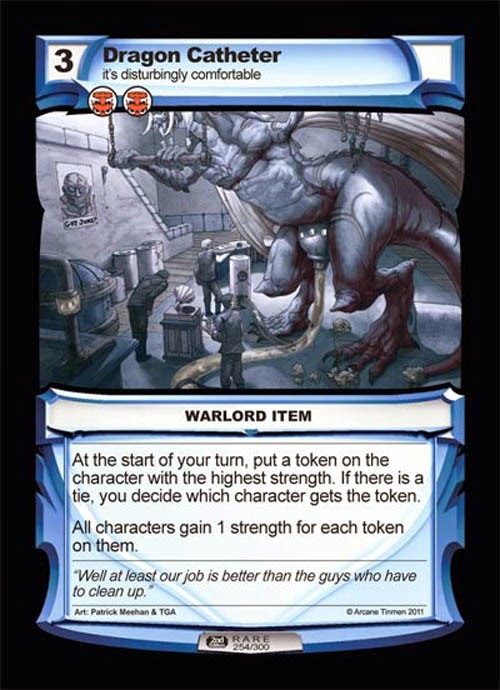 It offers a perfect introduction to The Spoils, allowing the opportunity for you to test out the strengths and weaknesses of each trade and leaving you with plenty of options for constructing your own killer, multi-trade decks. The main criticism I can level at the box is fairly minor; the game lacks any method for keeping track of influence and doesn't provide tokens for the various effects. 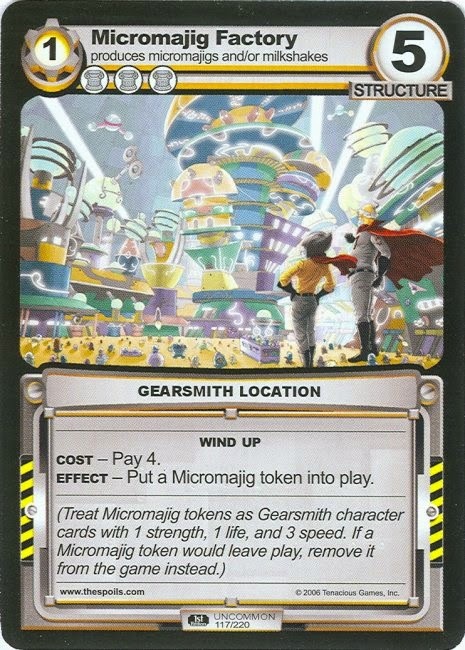 Where this really stands out is the micromajigs, as a lot of the Gearsmith cards can bring these into play but the game doesn't include any micromajig tokens or cards. In fact, you don’t seem to be able to buy these separately. I understand that both of these would end up adding cost to the box but both also suggest that this box aimed at players already well versed in the world of collectable card games and for players who have been spoiled by the deluxe offerings of games such as the recent Netrunner release it feels like your missing some essential elements. However this box retails at almost half the cost of those deluxe games on the market and with 205 cards in the box it does actually represent very good value. And now it’s time to address the giant M in the room because The Spoils is a Magic the Gathering clone. You can’t escape that this game sits in Magic’s shadow. 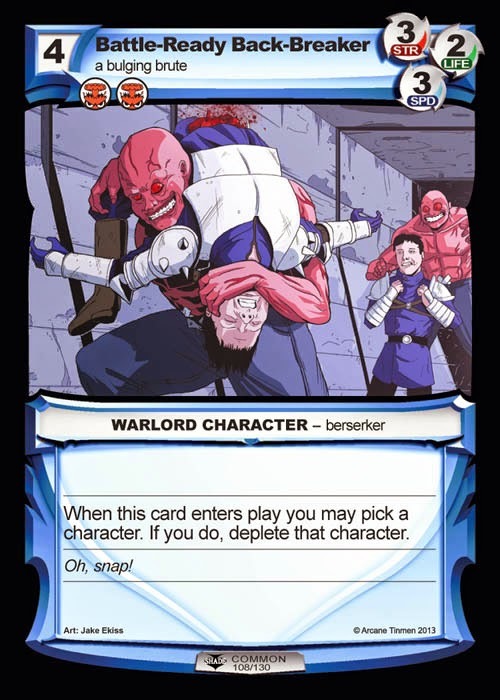 Every element from the resources to attacking a player with cards, tapping, summoning sickness, it’s all here (albeit with different names to prevent copyright infringement). However, The Spoils changes just enough to make it stand apart. These changes are mainly in the choices you are presented with. 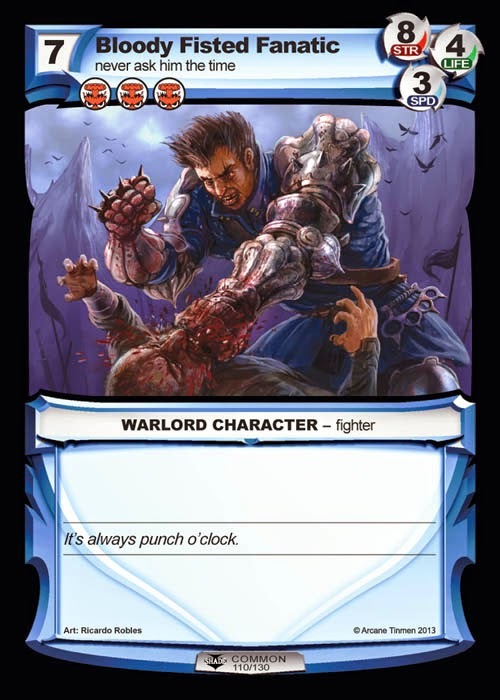 Combat can happen at any time during a turn and can happen multiple times, any card can become a resource and you can pay resources to draw more cards from the deck. All these little changes increase the complexity compared to Magic but also increase the tactical options available to you. These changes are also subtle and rather straightforward, and at no point do they overwhelm, it still remains a straightforward and easy to learn game. Where The Spoils peaks out from underneath Magic’s shadow is the humour. It’s a refreshing change from the po-faced Tolkienesque high fantasy we see in so many other games. The Spoils' reliance on toilet humour won't be for everyone but if you're interesting on taking a journey into its twisted world then The Basic Box of Awesomeness is the perfect place to start. we're can we buy a box?